With summertime comes an increase in vacations and travel. Whether you are planning a solo trip across South America or you are loading up your kids for a road trip to see the grandparents, traveling can be a wonderful experience, chock full of new memories. 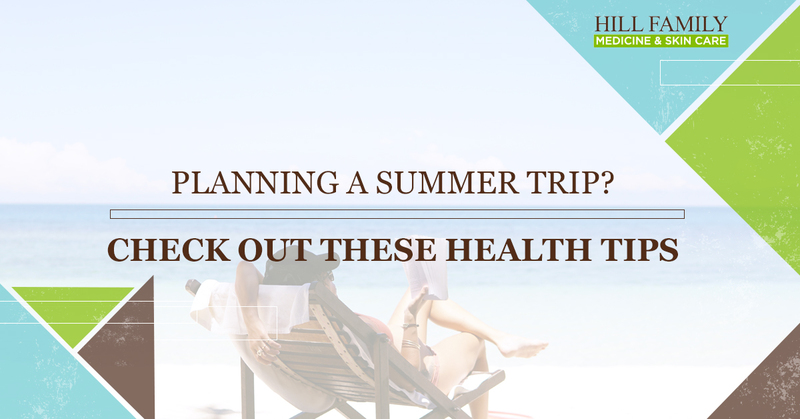 However, traveling can also bring with it an increased risk of illness and other health-related concerns. Here at our urgent care clinic in Bee Cave, we help with everything from wellness exams before a trip to post-trip care. Before you pack your bags, make sure you are ready for your trip ahead with these travel health tips and be sure to visit us with any questions or concerns about your vacation ahead. Before you head out on any big trip, make sure you do your research about the place you are visiting. This is particularly true for international travel. If you are simply taking a trip from Austin to the coastline of Texas, you probably won’t need to spend very much time researching what health risks there are in this area. However, if you are flying to a country in Central America, you will want to spend a decent amount of time reading up on the potential health risks in the countries you plan to visit. Focus on what diseases you might be exposed to, what the water quality is like in the area, and if there are any particular health risks in the specific regions you plan to visit. A great resource for this is the Centers for Disease Control’s website. Here you can choose the country you plan to visit, enter in some information about what type of traveler you are, and access a list of recommendations from the CDC for your upcoming visit. They cover everything from what vaccines are recommended to how safe the water is to drink. When in doubt, talk to your physician about the place you plan to visit. They can help guide you through preparations for your trip. No matter where you plan to travel, make sure you are up to date on all your vaccinations. As an adult, we often forget to schedule routine vaccines. Talk to your doctor about what vaccines they recommend for your trip. Vaccinations are extremely important if you plan to travel abroad. A simple vaccine can prevent you from catching serious diseases during your travels. Your doctor might recommend Hepatitis A and Typhoid vaccines if you will be traveling to at-risk countries and you plan to eat street food. These diseases can be easily transmitted through contaminated food, making it a wise choice to opt for a quick vaccine prior to travel. Try to schedule your doctor visit well in advance of your trip in order to ensure you have adequate time to receive the vaccines you need. Even if you plan to take a quick road trip right here in Texas, you should equip yourself with a few essential medications. First and foremost, make sure you bring along any prescription medications that you are currently taking. It is best to pack these items in your carry-on if you are flying to ensure you always have access to them in case of lost luggage. You can also bring along a few over-the-counter meds that will help out in case anything happens on your trip. A pain reliever, anti-diarrheal, and first aid kit are all recommended. It is better to be over prepared than to spend a late night wandering an unfamiliar town looking for a specific medication. Traveling can put you at risk for catching an array of illnesses. Make sure that as you enjoy your vacation you practice excellent hygiene. Wash your hands frequently. Avoid touching your face and bring along hand sanitizer for times you can’t access soap and water. While it doesn’t seem like much, good hygiene will go a long way in keeping you healthy throughout your trip. It can be easy to try to cram everything possible into your vacation. After all, whether you are in a new place or visiting old friends, vacations can be an exciting whirlwind. Make sure, though, that in all your excitement, you don’t forget to plan in time for rest. Getting a solid amount of sleep every single night will help keep you healthy throughout the whole trip. Nothing is worse than catching a cold or feeling run down halfway through your long-awaited vacation. Be sure you get to bed early and spend some time relaxing on your trip. Another common theme to vacations is putting your normal diet aside and going hog wild. While kicking back and letting go is something we all need in our life, don’t completely abandon healthy foods. Try to implement immune boosting foods into your diet each day. This could be as simple as starting your day off with fresh citrus, packed full of vitamin C, or adding in a salad here and there. Remember, you will enjoy your trip a whole lot more if you are healthy enough to make it to the all-you-can-eat shrimp buffet. Here at our urgent care clinic in Bee Cave / Austin, we can help you get ready for your summer travels. Whether you are taking a short trip in our own state or you plan to traverse across the globe, we will help you prepare for healthy travels. We provide adult vaccinations at our clinic and we can help determine which vaccines will most benefit you for your trip. Come visit us soon and get ready for the fun summer ahead.